Definition at line 1877 of file wined3d_private.h. Definition at line 1949 of file wined3d_private.h. Definition at line 1964 of file wined3d_private.h. Definition at line 1947 of file wined3d_private.h. Definition at line 1976 of file wined3d_private.h. Definition at line 2011 of file wined3d_private.h. Definition at line 2009 of file wined3d_private.h. Definition at line 2008 of file wined3d_private.h. Definition at line 1939 of file wined3d_private.h. Definition at line 2019 of file wined3d_private.h. Referenced by wine_glColor4f(), and wine_glVertex4f(). Definition at line 1943 of file wined3d_private.h. Definition at line 1916 of file wined3d_private.h. Definition at line 1973 of file wined3d_private.h. Definition at line 1880 of file wined3d_private.h. Definition at line 1935 of file wined3d_private.h. Definition at line 1917 of file wined3d_private.h. Referenced by context_acquire(), context_set_current(), and context_set_gl_context(). Definition at line 1893 of file wined3d_private.h. Referenced by context_acquire(), context_create(), and wined3d_sampler_init(). Definition at line 1891 of file wined3d_private.h. Definition at line 1888 of file wined3d_private.h. Definition at line 1977 of file wined3d_private.h. Definition at line 2020 of file wined3d_private.h. Definition at line 1972 of file wined3d_private.h. Definition at line 1975 of file wined3d_private.h. Definition at line 1970 of file wined3d_private.h. Definition at line 1971 of file wined3d_private.h. Definition at line 1974 of file wined3d_private.h. Definition at line 1988 of file wined3d_private.h. Definition at line 1922 of file wined3d_private.h. Definition at line 1913 of file wined3d_private.h. Definition at line 2018 of file wined3d_private.h. Referenced by wine_glFogCoordfEXT(), and wine_glVertex4f(). Definition at line 1914 of file wined3d_private.h. Referenced by wine_glDisable(), wine_glEnable(), wine_glFogf(), wine_glFogfv(), wine_glFogi(), wine_glFogiv(), and wine_glVertex4f(). Definition at line 1948 of file wined3d_private.h. Referenced by wine_glFogfv(), and wine_glVertex4f(). Referenced by wine_glFogf(), wine_glFogfv(), wine_glFogi(), wine_glFogiv(), and wine_glVertex4f(). Definition at line 1967 of file wined3d_private.h. Definition at line 1987 of file wined3d_private.h. Definition at line 1986 of file wined3d_private.h. Definition at line 1985 of file wined3d_private.h. Definition at line 1980 of file wined3d_private.h. Definition at line 1982 of file wined3d_private.h. Definition at line 1981 of file wined3d_private.h. Definition at line 2000 of file wined3d_private.h. Definition at line 2002 of file wined3d_private.h. Definition at line 2001 of file wined3d_private.h. Definition at line 1995 of file wined3d_private.h. Definition at line 1997 of file wined3d_private.h. Definition at line 1996 of file wined3d_private.h. Definition at line 1990 of file wined3d_private.h. Definition at line 1992 of file wined3d_private.h. Definition at line 1991 of file wined3d_private.h. Definition at line 2017 of file wined3d_private.h. Definition at line 1879 of file wined3d_private.h. 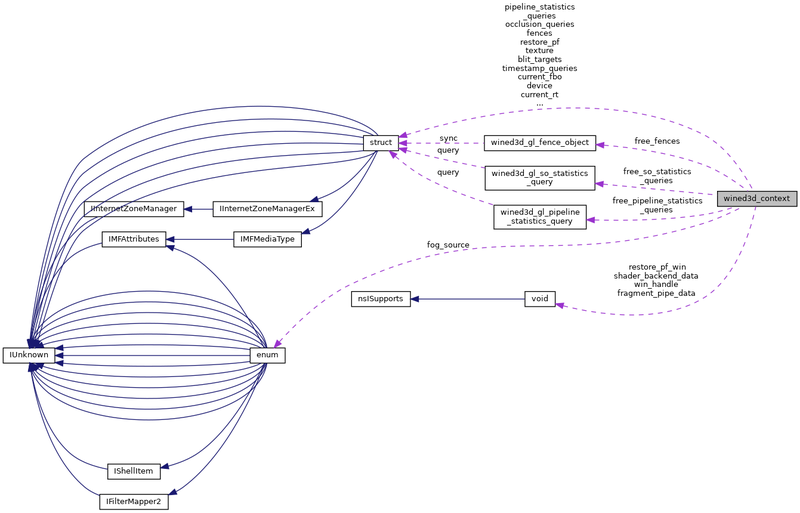 Referenced by arbfp_free_blit_shader(), buffer_sync_apple(), context_create(), context_restore_pixel_format(), context_set_current(), create_texture_view(), device_clear_render_targets(), dispatch_compute(), draw_primitive(), fb_copy_to_texture_direct(), fb_copy_to_texture_hwstretch(), gltexture_delete(), install_gl_compat_wrapper(), shader_glsl_destroy(), swapchain_gl_present(), wined3d_buffer_unmap(), wined3d_fence_test(), wined3d_fence_wait(), wined3d_occlusion_query_ops_poll(), wined3d_pipeline_query_ops_poll(), wined3d_rendertarget_view_destroy_object(), wined3d_sampler_cs_init(), wined3d_sampler_destroy_object(), wined3d_shader_resource_view_destroy_object(), wined3d_so_statistics_query_ops_poll(), wined3d_swapchain_set_swap_interval(), wined3d_texture_unload(), wined3d_texture_unload_gl_texture(), wined3d_timestamp_query_ops_issue(), wined3d_timestamp_query_ops_poll(), wined3d_unordered_access_view_cs_init(), wined3d_unordered_access_view_destroy_object(), and wined3d_unordered_access_view_set_counter(). Definition at line 1960 of file wined3d_private.h. Referenced by context_enter(), context_set_current(), and context_set_gl_context(). Definition at line 1962 of file wined3d_private.h. Referenced by context_set_current(), and context_set_gl_context(). Definition at line 1929 of file wined3d_private.h. Definition at line 1927 of file wined3d_private.h. Definition at line 1952 of file wined3d_private.h. Definition at line 1890 of file wined3d_private.h. Definition at line 1905 of file wined3d_private.h. Definition at line 1911 of file wined3d_private.h. Definition at line 1912 of file wined3d_private.h. Definition at line 1940 of file wined3d_private.h. Definition at line 1910 of file wined3d_private.h. Definition at line 1908 of file wined3d_private.h. Definition at line 1906 of file wined3d_private.h. Definition at line 1904 of file wined3d_private.h. Definition at line 1907 of file wined3d_private.h. Definition at line 1921 of file wined3d_private.h. Definition at line 1955 of file wined3d_private.h. Definition at line 1923 of file wined3d_private.h. Definition at line 1909 of file wined3d_private.h. Definition at line 1926 of file wined3d_private.h. Definition at line 1915 of file wined3d_private.h. Definition at line 1944 of file wined3d_private.h. Definition at line 1889 of file wined3d_private.h. Definition at line 1983 of file wined3d_private.h. Definition at line 1941 of file wined3d_private.h. Definition at line 2003 of file wined3d_private.h. Definition at line 1963 of file wined3d_private.h. Definition at line 1925 of file wined3d_private.h. Definition at line 1903 of file wined3d_private.h. Definition at line 1956 of file wined3d_private.h. Definition at line 1957 of file wined3d_private.h. Definition at line 1958 of file wined3d_private.h. Definition at line 1959 of file wined3d_private.h. Definition at line 2014 of file wined3d_private.h. Definition at line 2023 of file wined3d_private.h. Definition at line 1966 of file wined3d_private.h. Definition at line 1938 of file wined3d_private.h. Definition at line 1998 of file wined3d_private.h. Definition at line 1881 of file wined3d_private.h. Definition at line 2005 of file wined3d_private.h. Definition at line 1898 of file wined3d_private.h. Referenced by context_acquire(), is_full_clear(), wined3d_cs_exec_add_dirty_texture_region(), and wined3d_texture_create_dc(). Definition at line 1894 of file wined3d_private.h. Referenced by context_create(), context_set_gl_context(), swapchain_create_context(), swapchain_destroy_contexts(), swapchain_get_backup_dc(), swapchain_get_context(), swapchain_gl_frontbuffer_updated(), swapchain_gl_present(), swapchain_update_draw_bindings(), and wined3d_swapchain_set_swap_interval(). Definition at line 2013 of file wined3d_private.h. Definition at line 1920 of file wined3d_private.h. Definition at line 1897 of file wined3d_private.h. Definition at line 1950 of file wined3d_private.h. Definition at line 1900 of file wined3d_private.h. Definition at line 1993 of file wined3d_private.h. Definition at line 1945 of file wined3d_private.h. Definition at line 1936 of file wined3d_private.h. Definition at line 1937 of file wined3d_private.h. Definition at line 1946 of file wined3d_private.h. Definition at line 1931 of file wined3d_private.h. Definition at line 1933 of file wined3d_private.h. Definition at line 1930 of file wined3d_private.h. Definition at line 1932 of file wined3d_private.h. Definition at line 1924 of file wined3d_private.h. Definition at line 1934 of file wined3d_private.h. Definition at line 1918 of file wined3d_private.h. Definition at line 2022 of file wined3d_private.h. Definition at line 1961 of file wined3d_private.h.